Simply mix 1 scoop of Advanced Multi with 8 oz of cold water or your favorite beverage. Shake briskly in a blender bottle. Sip and enjoy! Take Advanced Multi first thing in the morning as a perfect way to energize your day. Advanced Multi can be taken twice per day. Once opened, please refrigerate to preserve nutrients. How To Enjoy: Simply mix 1 scoop of Advanced Multi with 8 oz of cold water or your favorite beverage. Shake briskly in a Greens Plus Blender Bottle. Sip and enjoy! Take Advanced Multi first think in the morning as a perfect way to energize your day. Advanced Multi can be taken twice per day. Add Greens Plus to your favorite protein or smoothie recipe for a nutrient rich Superfood boost! 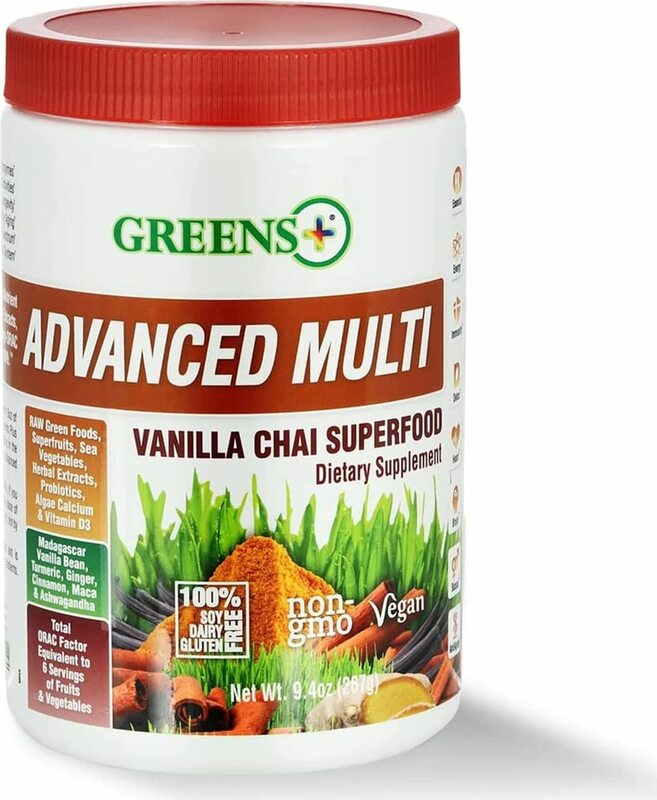 Almond Chai 1 scoop Advanced Multi 1 serving of your favorite Vanilla Protein Powder 1 cup Vanilla Almond milk 1 scoop of Greens Plus Organic Chia Seeds Add 8 ice cubes. Blend until smooth. Enjoy! This product contains Wheat Grass and is manufactured in a facility that processes Soy and Dairy ingredients. Made in USA. Natural wild berry flavors, malic acid, citric acid, stevia leaf extract. Simply mix 1 scoop of Advanced Multi with 8oz cold water or your favorite beverage. Shake briskly in a Greens Plus BlenderBottle. Sip and enjoy! Take Advanced Multi first thing in the morning as a perfect way to energize your day. Advanced Multi can be taken twice per day. Add Greens Plus to your favorite protein or smoothie recipe for a nutrient rich Superfood boost! Simply mix 1 stick of Advanced Multi with 8oz of cold water or your favorite beverage. Shake briskly in a Greens Plus BlenderBottle. Sip and enjoy! Take Advanced Multi first thing in the morning as a perfect way to energize your day. Advanced Multi can be taken twice per day. 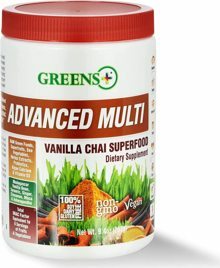 ADVANCED MULTI is a 100% Whole Food MultiVitamin, MultiMineral, & PhytoNutrient Delivery of RAW Green Foods, Superfruits, Sea Vegetables, Herbal Extracts, Probiotics, Algae Calcium & Vitamin D3 with Sambazon Acai Berry. Other ingredients: Natural wild berry flavors, malic acid, citric acid, stevia leaf extract.